The legendary grapefruit diet promised weight-loss results if you ate grapefruit or drank grapefruit juice before every meal. While this diet wasn't based on science, grapefruit juice does seem to have properties that promote a healthier body and weight. Drinking a small serving before meals may help curb your appetite and could improve insulin resistance. Weight loss ultimately occurs when you eat fewer calories than you burn, but grapefruit juice just may help you stick to such a plan more easily. Have a watery snack, such as grapefruit juice, about 20 minutes before your main meal to potentially help give your diet more impact. This effect was demonstrated when researchers from Vanderbilt University had 85 participants follow a low-calorie diet for two weeks. These same participants then continued the diet but added grapefruit juice, water or half a grapefruit before each meal for the next 12 weeks. When the premeal snack was added, participants naturally ate 20 to 29 percent fewer calories overall without reporting greater hunger, showed a study published in a 2011 issue of Nutrition and Metabolism. Participants lost an average of 7 percent of their body weight over the study period. Grapefruit juice, water and whole grapefruit eaten 20 minutes before a meal effectively squelched the participants' appetites, so they ate less. Grapefruit juice didn't exhibit some unique fat-burning quality, though. If you enjoy grapefruit juice and would prefer it to water or half a grapefruit before meals, then have a small glass as a weight-loss strategy. But, know that it doesn't have any greater effect than other low-calorie, watery options. A premeal glass of grapefruit juice may also have a notable impact on insulin, a hormone that impacts your blood sugar levels and plays a role in fat storage. In a study of 91 people, those who drank 8 ounces of grapefruit juice before each meal, three times a day, lost 3 1/2 pounds over the course of 12 weeks even though they weren't specifically prescribed a low-calorie plan. Participants who ate half of a grapefruit experienced similar weight loss. This represented a significantly higher loss than those who took just a placebo before meals, reported a study published in the Journal of Medicinal Food in 2006. Researchers aren't sure of the reason for the weight loss in this particular study, but it may have something to do with grapefruit's effect on insulin. Participants with metabolic syndrome who consumed premeal grapefruit or grapefruit juice also experienced lower insulin levels and an improvement in insulin resistance. Your pancreas naturally produces insulin after a meal, but when you eat an excess of carbohydrates -- especially sugary, refined ones -- you produce more insulin than your body can handle. An excess of insulin promotes your body to store fat. The more of it that circulates in your body, the harder it is to lose weight. When you're insulin-resistant, you may also feel tired, bloated and experience cravings for sugar and refined carbohydrates. The study results suggest that having grapefruit juice prior to meals may somehow help moderate the release of insulin, so you experience less of these effects and may lose weight. Even if you add grapefruit juice before meals, you'll still need to eat fewer calories than you burn to lose weight. Use an online calculator to estimate your daily calorie needs to maintain your current weight. Then, create a 500- to 1,000-calorie deficit from this number with diet and exercise. Avoid eating fewer than 1,200 calories if you're a woman or 1,800 if you're a man, as this could stall your metabolism and lead to nutritional deficiencies. If cutting calories alone puts your calorie intake too low, increase physical activity to make up the difference. Adding grapefruit juice helps boost your vitamin C intake. People who regularly consume grapefruit juice also tend to consume abundant amounts of magnesium, potassium and dietary fiber. They tend to consume a high-quality diet overall, showed a 2001 study in Food and Nutrition Research. When you revamp your diet for weight loss so that you eat mostly whole, unprocessed foods with an emphasis on lean proteins, whole grains and fresh fruit, you'll improve the quality of your diet and get ample amounts of these, and other, nutrients. Exercise also boosts weight loss. Go for the minimal 150 minutes per week of moderate-intensity cardiovascular exercise recommended by the Centers for Disease Control and Prevention. Exceeding this amount affords extra health and weight-loss benefits. Strength-train to help preserve and build lean muscle as you reduce calories, too. Muscle demands more calories to sustain, so it boosts your metabolism. Aim for at least two total-body sessions per week. Grapefruit juice averages about 100 calories per 8-ounce serving. If you do drink it prior to meals, make sure you account for it in your total daily calorie intake. Otherwise, the extra calories could inhibit weight loss or -- worse -- cause weight gain. Also know that grapefruit juice can interact with certain prescription medications, such as cholesterol-lowering drugs, blood pressure-lowering drugs, organ transplant-rejection drugs, anti-anxiety drugs and even some over-the-counter antihistamines. In some cases, grapefruit juice increases absorption of the medication -- making it dangerously potent -- or it can reduce the absorption so the drug doesn't work as well. If you're on a prescription medication, consult with your doctor or pharmacist before adding grapefruit juice to your diet. 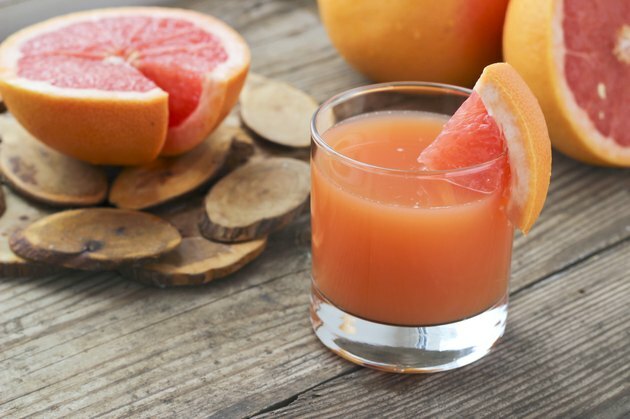 What Are the Benefits of Drinking Ruby Red Grapefruit Juice Before Meals?